Guard your Star Wars collection than this 7-inch Obi-Wan Kenobi statue! Based on the film that started it all. Customize his look with his hood on or off. Comes with a separate empty robe and deactivated lightsaber! Obi-Wan Kenobi joins Kotobukiya's ArtFX+ lineup. Based on the film that started it all, Alec Guinness is beautifully captured as Obi-Wan in this 1:10 scale Star Wars: A New Hope Obi-Wan Kenobi ArtFX+ Statue. This realistic piece shows the legendary Jedi in a defensive stance, as he prepares to duel his former student. Customize his look by putting his hood on or off, and as an added bonus, this statue comes with a separate empty robe and deactivated lightsaber. 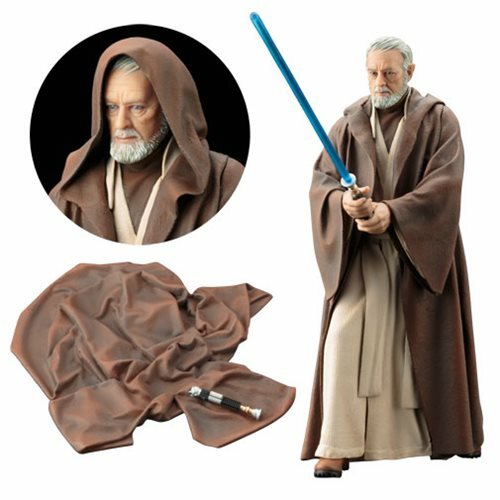 There's no better guardian for peace in your Star Wars collection than this 7-inch tall Obi-Wan Kenobi statue! More affordable than the ArtFX series, ArtFX+ series statues are smaller in scale (1:10 scale) and come with interchangeable and bonus parts (hence the "+" in the name) for more variety, making them easier to collect for fans. Characters are recreated faithfully with various additions and made of high-quality PVC. To ensure security, ArtFX+ statues feature magnets in their feet for display on the included bases. Ages 14 and up.